"Shattering the Concrete: Artists, Activists and Instigators"
We live in a historic moment fraught with both crisis and complexity - where the dramatic transformation of ideas and institutions may be a precondition for survival. Our economy continues to fail to provide for its citizens; black and brown bodies in America are deprived of dignity and security; our borders are becoming militarized zones; and energy extraction methods threaten both people and the planet. And yet, simultaneously, there is an ever growing call for a more just, equitable and cleaner future; there is a surging wellspring of solutionary thinking, tactical innovation and collective power. Mass popular social movements are once again surging, from Occupy Wall Street and The Movement for Black Lives to the Climate Justice Movement and more. Peel back the layers of these uprisings and at their heart we find the work of hundreds of artists and organizers using culture and creativity to deploy creative interventions that are disrupting the mainstream narrative, amplifying the conversation around these issues and helping to create opportunities for concrete gains in the political and institutional realm. These movements, and the many artists who contribute to their richness, have brought renewed focus to the relationship between art and politics, between narrative-shifting and policy and between creating meaning and building power. Shattering the Concrete: Artists, Activists and Instigators builds on this legacy by exploring the role that art can play in challenging our current political paradigm and fomenting political change. 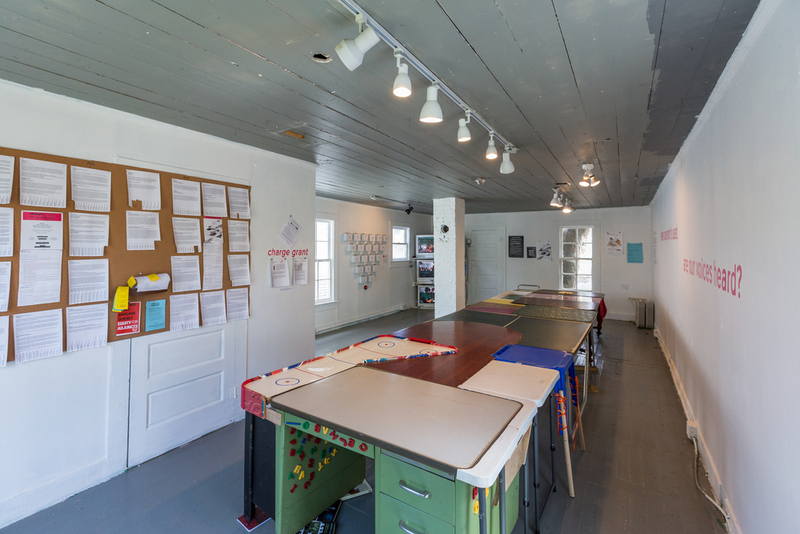 Well situated within the celebrated community-based art non-profit, Project Row Houses, we are reminded how the work of artists can become directly involved in reclaiming power through community organizing. Seven artists and collectives are situated on Holman Street, presenting work that approaches themes including prison reform, climate justice, immigration, housing rights and police brutality. Together, they explore the intersection of art and activism expressed through engagement, language, science fiction, performance, protest and play. Papermaking workshops, hybrid theatre, public interventions and oral history are only a few of the methods used by these artists. Participating artists include The Argus Project (Gan Golan, Ligaiya Romero and Julien Terrell), Charge (Jennie Ash and Carrie Schneider), The Natural History Museum (a project of Not An Alternative) in collaboration with T.E.J.A.S. (Texas Environmental Justice Advocacy Services), Nuria Montiel & John Pluecker, People’s Paper Co-op (Courtney Bowles & Mark Strandquist), Storyline Media (Michael Premo and Rachel Falcone), and Verbo•bala (Adam Cooper-Terán and Logan Phillips). Their work exists as both a call to action and provocation within and outside of the confines of the houses of Holman Street, engaging communities and inviting them to participate in altering the conditions that shape our lives. Together their work asks: How does art serve to break apart what has been deemed concrete and insurmountable, and reformulate reality into something new? Many groups, such as Not an Alternative’s The Natural History Museum, embody a practice rooted in intervention and protest. Their campaigns exist both on and off-line affecting public understandings of our institutions and the stories they promote. Most recently, the group led the charge in a viral campaign set to remove oil billionaire David Koch from the American Museum of Natural History’s board of directors. Last Spring the group released a letter from 150 top scientists expressing concern about climate change obfuscation in institutions of science and history. The letter went viral overnight, and 552,000 people subsequently signed a petition. In December 2015 David Koch resigned from the board of directors, after 23 years. While his publicist denied the group's efforts having any bearing on his decision, the timing and massive public pressure it generated suggest otherwise. For Round 44 The Natural History Museum continues their work of modeling a museum of the future that celebrates action on climate change. Their project is site-specific, taking the socio-political landscape of Houston, and more precisely the Houston Museum of Natural Science as both case-study and critique. They have further strengthened their work by teaming up with the local Environmental Justice group, T.E.J.A.S., to both conceptualize the installation and host a series of programs across Houston that will both build public participation toward healthier communities in Houston and take a stand against the fossil fuel industry. 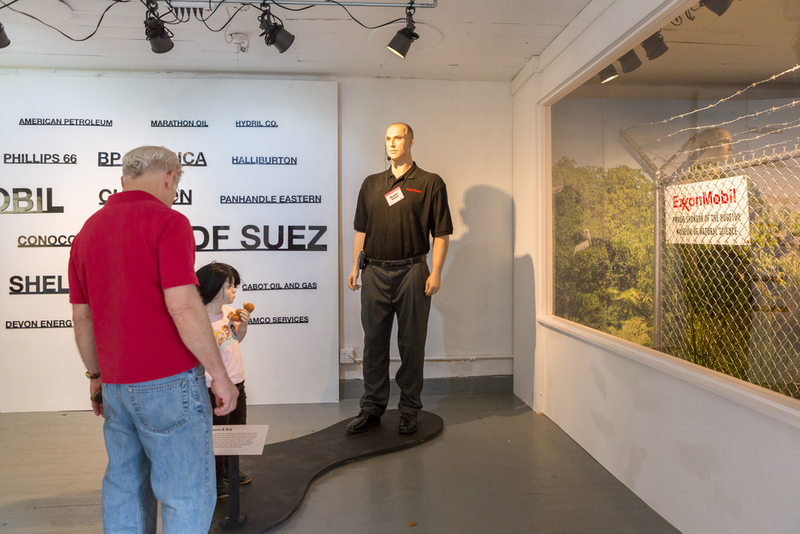 Within the walls of 2505 Holman the group has replicated and re-framed the Houston Museum of Natural Science’s installations - rather than acting as an homage to the gas industry, Mining the HMNS depicts the socio-economic impacts of low income communities living in the shadow of refineries; communities that face the worst underreported environmental justice in Texas, and perhaps the country. The Natural History Museum’s installation is both a celebration of the work done by local environmental justice groups in Texas and a call to take back the institutions whose stories shape our understanding of the world. This idea of investigation as a means of inciting change can also be seen in other works, such as Charge’s self-titled installation. Inspired by Valuing Labor in the Arts: A Practicum organized by Helena Keeffe and Shannon Jackson for The Arts Research Center at UC Berkeley, artists Carrie Schneider and Jennie Ash forged together a series of convenings in Houston to 1. platform artist led alternative models of sustainability 2. advocate for equitable compensation for artists 3. consider artists' work in the larger economy. The first iteration of Charge took place in November 2014 and the second in January 2016, as events that brought together artists, curators, organizers, researchers, and educators to conceive and host discussions, direct actions, lectures and workshops that explore alternative, conceptual, organizational, and economic models of sustaining one’s art practice. Together, they engaged critically and generativity within the arts ecosystem and broader social contexts, advocating for equitable compensation along the way. Their endeavors herald the work of the artist, understanding that the artist’s voice is often excluded from platforms where critical arrangements about their work are made. Continuing their meaningful work in Houston, Schneider and Ash have built a table collaged from many other tables set with layers of engagement; and invitation for artists, curators, organizers and researchers from across Houston to continue the conversations that have emerged in their past convenings, by “asking what worked, avowing what else, and imagining what's next”. In a participatory turn, the artists are asking us to decide what kind of programs we want to see take place in their row house. The opening reception will include an activity where visitors visually vote on a which conversations sparked at Charge they would like to see carried further, informing the series of programs to take place in the Charge house. We are especially honored to host a conversation between Mel Chin, Jesse Lott and 20 artists. As these artists seek change by forging a new future for the art community, others look to art as a means of reclaiming lost histories. 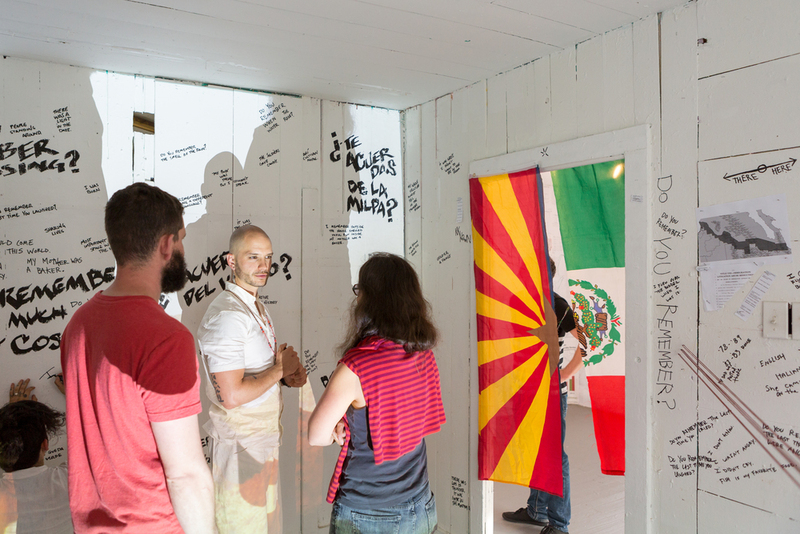 KARANKAWA CARANCAHUA CARANCAGUA KARANKAWAY is situated in 2509 Holman St. as a visual and sound installation; a poem that honors the legacy and language of the Karankawa people of Southeast Texas. 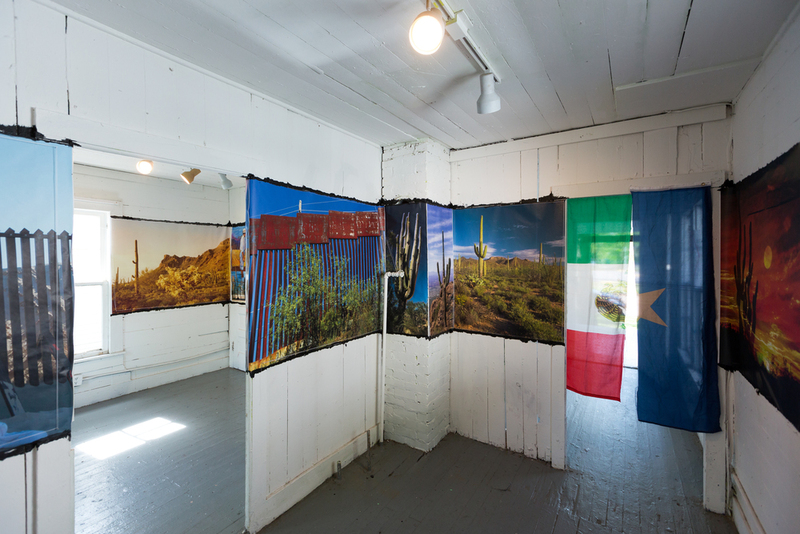 The collaborative, multimedia piece between visual artist Nuria Montiel, writer and translator John Pluecker, and musician/sound artist Lucas Gorham was developed in conversation with members of the Carrizo Comecrudo tribe and people who associate themselves with the Karankawa native identity. The Karankawa are a First Peoples nation native to the Houston area and, as with native populations across the globe, are simultaneously both appropriated, and erased. 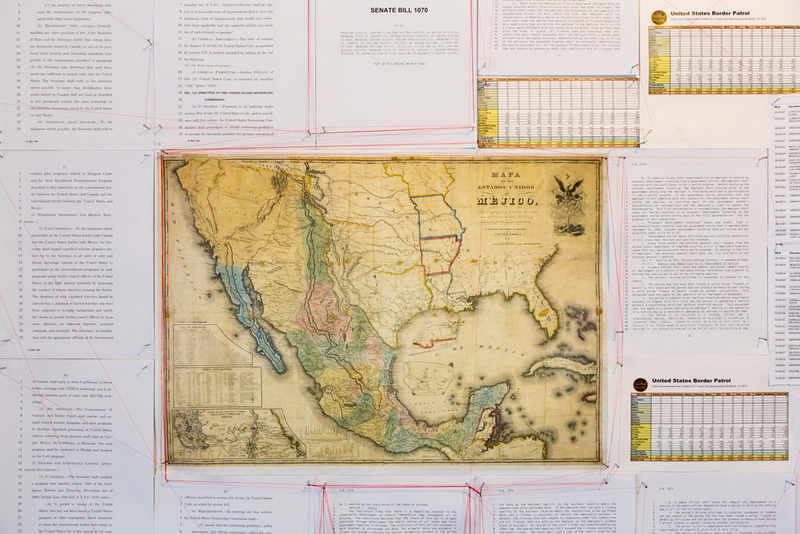 Together the group will embark in a series of print and sound-based projects that will reclaim both public space and the airwaves, at once illuminating Houston’s relationship to its native history and re-asserting the legacy of its indigenous people. Their installation and series of events are accompanied by a series of interviews and recordings that illustrate their partnership and cross cultural conversations and is partially a product of Pluecker’s decades-long investigation into regional (anti)colonial histories and indigenous languages. The work of Montiel, Pluecker and their diverse team serves to make the invisible visible by re-asserting the presence of an erased history. Their artistic process is one of learning how to see anew, of asking how culture is shaped by colonial structures that validate, erase and distort histories. Together the group asks how culture survives and morphs amid the pressure of modern capitalist structures. They ask what the resonance of First Nations is within contemporary identities and remind us to look again at the culture that surrounds us, as it is certainly shaped by structures we are unaware of. In a country with a staggering 70 million+ people living with criminal records that create obstacles to employment, housing, education and healthcare, The PPC serves as a call to action, using art as a means to move through seemingly impassable situations and directly releasing people from the burden of criminal records. For their installation at Project Row Houses, PPC is working with PLSE to train students at Texas State University on running expungement clinics, and will then be leading a series of clinics in Houston’s 3rd Ward. However, the clinics are not just business, as each is partnered with a papermaking workshop where participants will shred their old records as they are then asked to rewrite a new story of self. 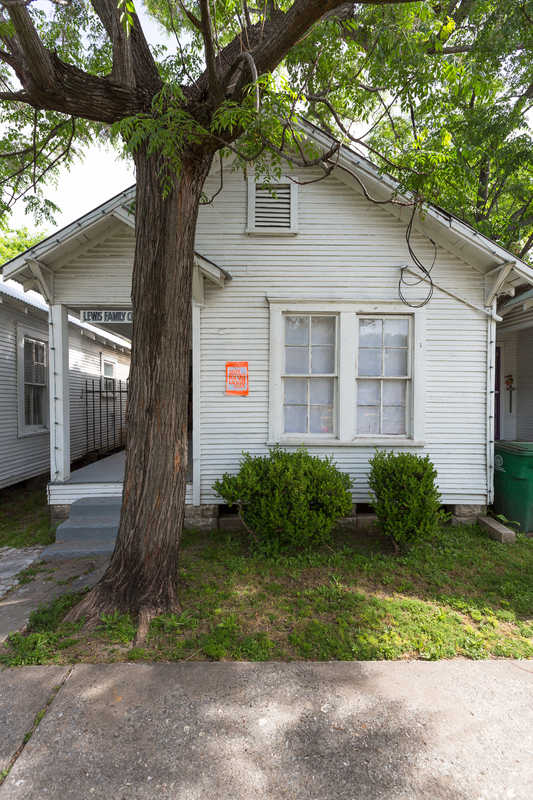 Mark and Courtney are also in residency at Project Row Houses as part of a Visual Arts Network Grant. Their goal while in Houston is to use this site as a space for future expungement clinics in order that lawyers trained by PLSE can continue to hold regular clinics in Houston. The project is one of the few in America that merges artistic practice with concrete legal remedies. The forms these projects of creative resistance take in the public realm are often marked by moments of conflict and disruption, moments that highlight the absurdity of the systems that dictate our lives, and the socio-economic conditions that color them. This disruption is evident in The Argus Project, Argus Awakens, which is installed on the 2513 art house on Holman Street in 3 parts: a video installation, a suit of tactical counter-surveillance body armor and programs that collectively serve to continue the conversation about police brutality in America and the rising #BlackLivesMatter movement. The installation champions citizen videography and movements rising up against state violence and police impunity; against the grim social reality where Sandra Bland can die in a Texas jail after being stopped for a broken tail light, yet a police officer can walk free after killing an unarmed child. The Argus Project takes inspiration from the Greek myth of Argus, the giant with 100 eyes who was a watchman both for and against the gods and is installed at 2513 Holman as a quasi-superhero of the citizen countersurveillance movement, a watchman for communities most affected by systemic violence in America, a symbol that may inspire others to take action. A suit of tactical counter-surveillance, Argus imitates militaristic body armor and comes equipped with 15 body cameras that surveil the police. It is as much provocation as it is performance and asks an almost absurd question: If police need to wear body armor to protect themselves while in public, what does The Public need to wear to protect themselves from the police? The video installation tells a story of what actions everyday people can take to hold the state accountable. The accompanying programs seek to support local communities in developing the knowledge and expertise to act as citizen videographers. In light of an uncertain, uneasy and unstable tomorrow, artists in Round 44 embody a fierce persistence and determination. Their steadfastness and commitment to creative inquiry pushes for new understandings toward the co-creation of a world we want, one we all deserve to live in. For Round 44, they have created an installation titled The 28th Amendment, a work that explores an imaginary future where the landmark passage of a U.S. constitutional amendment mandates that every citizen has the right to adequate housing. Their multidisciplinary installation consists of intimate narratives, large-scale photographs, musical conversations and audio testimony; each building upon the last to create a collective portrait of the people and social movements that led to this reform. Central to their installation is the question, “what’s next?” Now that revolutionary reform has passed, how do we as citizens ensure that a right to housing persists? Building on the teaching of Octavia Butler, Samuel Delaney and the many organizers they have worked with as part of the housing and human rights movements, Falcone and Premo use the power of speculative fiction to imagine a world without the slow, systemic violence of inadequate housing and homelessness. The 28th Amendment will begin with a storytelling workshop that incorporates the vision of Houston natives into the Round. Bringing housing and homelessness organizers in Houston together to tell their vision of a new world is their way of adding to a legacy of artists and activists who center their work on creating our future through writing it. It is this destruction and reconstruction of paradigms that all the artists in Shattering the Concrete are actively engaged with. Verbo•bala’s Acordarnos focuses in on border identity and mestizaje through a multimedia performance that will take place on opening night. Through both the performance and installation of the work, the group embarks on a journey of remembrance, recalling lives that have been lost at the border, the beauty of the land and militarization of the border space, while acting as homage for the struggle we all carry within ourselves. Their work acts in defiance of “colonial amnesia” and traditional history books, calling upon the borderland - currently a place of militarization and fear - as instead, a place of deep wisdom, and a spiritual base for first nations and immigrants alike. Verbo•bala’s work is as much a performance as it is an invocation, channeling the creative spirit and connective tissues within us all toward our unknown tomorrow. Each artist in Round 44 has taken it upon themselves to come to know the landscape of Houston and integrate it organically into their work. Preparing for the exhibition has been a process of curiosity and discovery; a process driven by the desire to connect in meaningful ways and impact daily life within Houston communities. In varying means and degrees, each artist sought to integrate their work into the ever shifting landscape of Houston, designing entry point for our neighbors in the 3rd ward, students at Texas State University, Houston Science Museum goers, people living with criminal records, local activists and creative practitioners and more. Be it through phone conversations and email exchange, discussions around dinner tables, brainstorming strategies at coffee shops, or hosting skill share workshops in unexpected venues, each group asked questions about how their work would fit into the larger socio-political landscape of Houston, before initiating a course of action. As such, the work in Shattering the Concrete embodies an expansive understanding of art, one that is both analytical and experiential, one that develops an analysis of our socioeconomic conditions and then engages with communities to alter the conditions of our daily lives. In so doing, the work champions stories that have been intentionally ignored and unveils the reality that we are stronger when we act together.